Copyright Chester-le-Street Heritage Group - All rights reserved. Chester-le-Street Heritage Group was formed in 1986, although its origins go back to the mid 1960s when it was known as Chester-le-Street Local History Society. The main activities of the Group are the study of local history issues, in particular Chester-le-Street and the surrounding area. Our intention is to research and share information and knowledge relating to the history of Chester-le-Street throughout the ages. Wherever possible we aim to publish either in Newsletter, Book, CD or through this website, information that we feel may be of interest to amateur or professional historians, researchers into family trees or even those who only want to find out a bit more about our town. In early August 2007, the Charity Commission confirmed that Chester-le-Street Heritage Group had been awarded Charity Status. 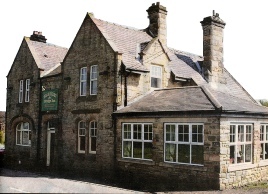 It is understood that a planning application has been made for the demolition of “The Falcon” public house and for the redevelopment of the site to incorporate eight number, three bedroom, detached low rise homes, with associated driveways, landscaping and infrastructure. Although no documentary evidence is available at the time of writing, it is believed that “The Falcon” was built and began trading in the late 1960s and first appeared on historical maps c1970. 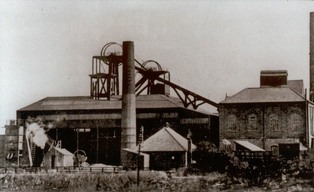 The area surrounding the site is mainly residential, however, South Pelaw Colliery and the Pontop to South Shields railway line were previously located in close proximity to the north and west. The proposed development of the currently derelict land on Pelton Fell Road (where the old Gas Works was previously located), is to be the subject of a Public Exhibition at Chester-le-Street Community Centre, on Newcastle Road, Chester-le-Street from 3pm to 7pm on Thursday 17th January, 2019. Regeneration of a vacant site, which is currently an eyesore. Provide a new B&M Homestore, complimenting their existing town centre facility. Create around 40 new full & part time jobs, as well as spin-off employment in construction. Enhance the choice of retail facilities available to the residents of Chester-le-Street.  Reduce the need for people to travel further afield, including by private car.  Generate linked trips with existing facilities in Chester-le-Street town centre. 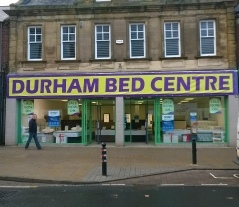 The premises currently occupied by Durham Bed Centre at 73-75 Front Street has recently been the subject of a planning application. The application intends to provide an educational training facility for 16 to 19 year olds who are or would be either ‘Not in Education, Employment, or Training’ which is often abbreviated to ‘NEET’. This facility will be focused on young people who have had limited success at school and are therefore finding it difficult to gain employment. The premises were previously occupied by 'Semichem' and prior to that 'Tandy' and many years ago by Walter Willson's supermarket store. Information received from the stall holders in the Market Hall (previously known as In-Shops) verifies that they have been informed by the Management, that the premises are due to close at the end of November this year. During the meeting that was held a few weeks ago, all the stall holders were advised to seek business locations elsewhere and already this month four of the businesses have moved to other shops on the Front Street, which leaves just five businesses still occupying the premises. Seemingly, the whole of the premises is scheduled for demolition and the vacant area is to be converted into a car parking space. The building is owned by a local family concern and is apparently in a good state of repair, although there are suggestions that there are problems with the roof. A Planning Application was published on 1st October, 2018 by Durham County Council, confirming the proposed demolition of the Market Hall and the intention to convert the site to a car park. A planning application has been submitted to change the remaining unused parts of the Co-operative building from retail to residential, so that 14 new apartments at 1st floor level can be installed. Although not a listed building, it is located within the town centre conservation area and is identified as notable, in an Art Deco style and contributing to the diverse appearance of the Front Street. The first floor is currently unoccupied previously accommodating the furniture/carpet department and a café, which have been empty for several years. The 14 apartments will be either 1 or 2 bedroom units, with separate living rooms/kitchens and bathrooms. The development appears to be directed at first time buyers or accommodation for commuters. Chester-le-Street Co-op Building Planning Application. Plans have now been accepted for the opening up of the market place in an effort to alleviate the risk of flooding to residents and businesses along the Cong Burn corridor and improve the appearance of the area. The scheme will involve relocating the existing market and opening up of the area to reveal the culverted water course. The Cong Burn was first enclosed in the 1930s due to concerns about the health risks from rancid water emanating from industries operating further upstream which used to discharge effluent into the water course. These industries no longer exist and the waters of the Cong Burn are now clean and able to support aquatic life. To relocate the market place there will need to be changes to the red carpet area adjacent to the new war memorial. Additionally, there will be improvements to the Front Street area, by decluttering the street scene, widening the footpaths and modifying the bus turning circle. Work could begin as early as October 2018 on the initial stages of preparing the area. Following the collapse of the gable end of the old Waldridge Working Men’s Club the building has now been demolished. The club building had been derelict for some time and had suffered from vandalism and theft of lead from the roof in the past, which may have contributed to its unstable condition. A decision was therefore taken that the building should be demolished for safety reasons.The club, otherwise known as “Dene House”, had the foundation stone laid by William Morris Esq., on the 15th July, 1905. When the Club closed, it became a private residence, eventually being abandoned due to structural problems. At the time of writing this it is still unknown who actually owned the property. Plans are being put forward to acquire funding in the region of £900,000 to make improvements to the Memorial Park on Station Lane, Pelton Fell. The proposals include replacing one of the tennis courts with an open-air performance area, developing a “Ninja Warrior” style course for children, improvements to the play facilities and repairing the area around the war memorial, together with making the park more suitable for disabled access. The park was created for the mining community back in 1922, so that they could spend their free time with their families in pleasant surroundings. Local Historian Dorothy Rand has been awarded an MBE in the 2018 New Years Honours List for her work in Local Government and the Community in Durham. Dorothy has been the author of many local history books including Grange Villa, Handen Hold Heritage, Memories of Sacriston, just to mention a few. More recently, Dorothy has been involved with the new artworks which have been erected at Newfield and Pelton Lane Ends, as well as the Pelton Memorial located just outside the new Pelton Library. 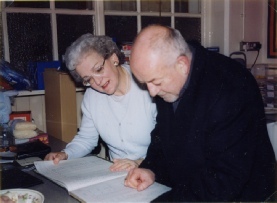 Dorothy is pictured here with actor Tim Healey when work began on the new Pelton Schools buildings. New Artwork for Newfield and Pelton Lane Ends. Two new pieces of artwork/signage have been installed on the approaches to Newfield and Pelton Lane Ends. They commemorate the area’s history going back to the Bronze Age. The artwork displays a sword, a shield and a spear, representing the area’s Bronze Age history. The heritage of the mining industry is depicted by the inclusion of flames, a miner’s banner and a pit head wheel, with a set of railway tracks highlighting the importance of the local railway infrastructure. Also, there are some poppies included as a tribute to the local men and women who gave their lives in the two world wars. Local historian Dorothy A. Rand worked together with the artist Graeme Hopper, the school pupils and the Local Residents’ Association to create the artwork/signage, which has been placed on the approach to Newfield from Pelton Fell and at Pelton Lane Ends on the road leading from Pelton. 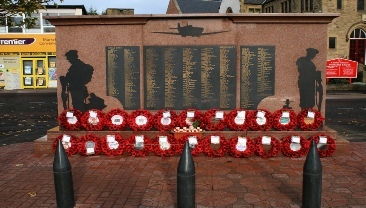 The installations are to be launched at a ceremony on Thursday 30th November at 10.30am. The site where the Civic Centre once stood is now up for sale. Durham County Council has announced that the land is on the market, but the asking price is currently unknown. The Civic Centre was opened by the Duke of Gloucester on the 6th May, 1982 and demolished in November 2014 and won awards for its design and its steel construction. 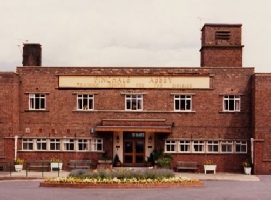 There was even an attempt to save the building by having it made Grade II listed, but that unfortunately failed. However, there has now been a call for the money raised by the sale of the land to be reinvested in the town. One suggestion is for the money to be used to directly support community buildings, which would benefit all residents and the various groups such as those running art projects and youth groups etc.. The land is now earmarked for new housing. 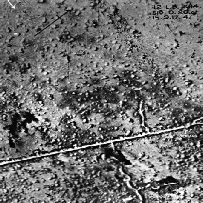 Reconnaissance photographs from the 1st World War show the effects of a raid on the German trenches at Cherisy in France by the 9th Battalion of the Durham Light Infantry. The exhibition started on 15th September and runs until the summer of 2018. Admission is free and the exhibition is open from Monday to Friday from 9am until 4pm. TV Screens proposal for Parish Church scrapped. Plans to install several 50” TV screens to the interior pillars of the Parish Church have been scrapped due to opposition from members of the congregation, Historic England and Chester-le-Street Heritage Group. 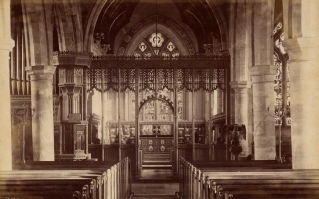 The church is a Grade 1 listed building dating from the 13th Century and stands on the site of original wooden church where the body of St. Cuthbert lay before moving to Durham Cathedral. The recently held “old photographic exhibition” at the Lambton Arms, has proven to be a very popular event and will be the venue of choice for future displays. 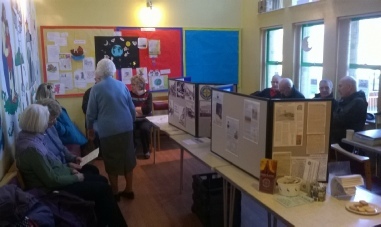 The exhibition featured photographs from the Group’s recent research into the local Collieries, including Pelton Fell, South Pelaw, Waldridge A and D pits and there was also a collection of old photographs of teachers and pupils who attended Chester-le-Street Secondary Modern School, at Bullion Lane in days gone by. If anyone is interested in in seeing the collections, they will be available to view when the Group restarts its Drop-In Sessions in September. (See Below). The college has been returned to normal following it being transformed into a Police Station for the new series of George Gently, the BBC’s well-loved Crime Drama due to be aired on 21st May and later this year. Unfortunately, this will be the last series for Gently and Bacchus and will include two feature-length episodes entitled “Gently Liberated” and “Gently and the New Age”. In December last year,the College was transformed into a 1940s period Police Station and its reception area converted into a full custody suite. The remains of a “Roman Bathhouse” and “Hot Room” are believed to have been found in the back gardens of two adjoining homes in the town. 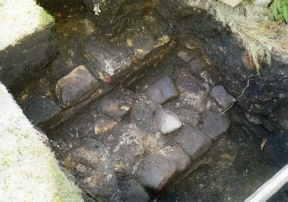 Amateur Archaeologists were given permission from the householders to dig test holes in their back gardens, which soon revealed the remains of a wall about two feet below the surface which were identified as the rooms where the legionnaires would have changed. It has always been believed that a bathhouse must have existed near the Roman Fort in the town and these finds have been dated by experts to around 150AD , in the time of the Emperor Hadrian. The excavations have now been covered over again. This week saw the demolition of the old Wardles Bridge Inn, which at one time in the none to distant past was a popular watering hole. Recent planning permission has been obtained for the building of 10 holiday homes, each with a “sun hut” on the site. The original Inn was located further along the road and still stands today, although it is now a private home and was in existence in the 1850s. The name “Wardles” probably derives from that of the Wardel family who owned nearby Edmondsley in 17th & 18th Centuries. 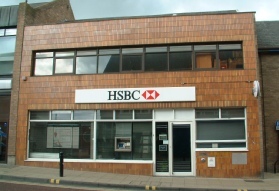 The HSBC Branch at 101, Front Street, Chester-le-Street, closed its doors for the final time on Friday 20th January, 2017 at 2.30pm..
All accounts will have been transferred to their Bridges branch at: 49-51, The Bridges Shopping Centre, Market Square, Sunderland and staff will have been transferred to the HSBC branches at Durham & Sunderland. 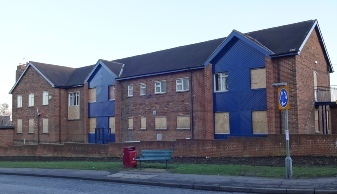 This week sees the demolition of Mendip House on West Lane, which was previously a nursing home that closed earlier this year. Built in 1959, Mendip House provided 28 beds which were all single rooms, but were not en-suite. The two story building also included spacious lounges and dining areas. The remains of around 17 to 28 sets of skeletons which were discovered during the course of building works on Palace Green, Durham in 2013, are to be re-interred at Elvet Hill Cemetery. The skeletons are those of Scottish prisoners who were captured at the Battle of Dunbar in 1650. They were apparently forced to march from south east Scotland to Durham City. Many died during the journey, some however escaped, but others were executed or died of disease or malnutrition while imprisoned. It is possible that there are more mass graves lying uder the current University buildings. 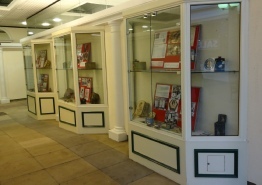 Chester-le-Street Heritage Group have set up a mini exhibition of Dainty Dinah and Horner’s memorabilia in the vacant display windows at St. Cuthbert’s Walk shopping mall. The historic “Hylton Castle” in Sunderland which has been described as a “Forgotten Gem” along with an old Fire Station have been awarded a £5.4m cash boost by the Heritage Lottery Fund. 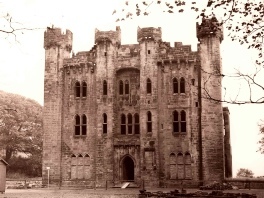 Hylton Castle which dates from the 14th Century, but stands today as an empty shell, is set to become a Community, Educational and Visitor attraction with a £2.9m grant and a further £1.5m from Sunderland Council. Sunderland’s old Fire Station is to receive £2.5m to make it into an Arts & Heritage Centre. Lambton Estate £28.5m plans set to secure its future. It appears that a planning application put forward to secure the future of the Lambton Estate is expected to receive approval. The plans included building around 400 (mainly executive) homes at the estate’s southern edge along with shops, offices and a community hub.The money raised would be used to restore the Grade II listed Lambton Castle, the Lamb Bridge and some of the stables. 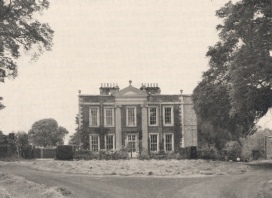 Biddick Hall located within the Lambton Estate, was the setting for the recently televised BBC drama production “The Paradise”. This is the new book by Dorothy Rand. It tells the story of Jack and Bella Lawson, later Lord and Lady Lawson of Beamish. Jack was a miner and lived locally 1910-1965, he worked as a member of the DMA, as a County Councillor and as our MP to improve the working and living conditions of miners and other workers. He was known as "The Champion of the Working Man". Bella pioneered Child Welfare Clinics in County Durham after WW1. New information provides interesting accounts of local events, including the story of the Lawsons' adopted son Clive who was killed by the Beamish Bomb in 1942. 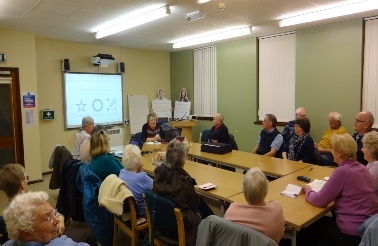 The Heritage Group have embarked on a new project to record as much information as possible about the Collieries of Chester-le-Street and the surrounding area. For this to be a success, the Group need the help of ex. Miners and their families. Please click on the arrow to find out more. The Chester Chronicle 1917 and 1918 Editions now available. The Heritage Group have just completed the 1917 and 1918 Editions of the Chester-le-Street Chronicles which are now available on DVD. These digitised pages provide a fascinating insight into the period of the 1st World War and the effects it had upon our local community. The new ‘Pelton Memorial’ unveiled Friday 20th March. The new ‘Pelton Memorial’ has been installed opposite the entrance to the Lavender Centre in Pelton Village and was unveiled at 2pm on the afternoon on Friday 20th March, 2015. 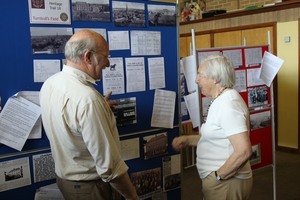 Kevan Jones MP, local Historian Dorothy A. Rand and Council dignitaries attended the unveiling. 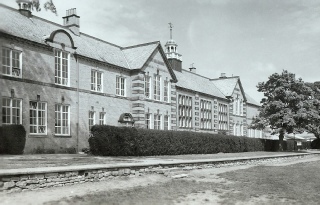 Did you attend Chester-le-Street Grammar School in 1960? Can you help identify the pupils and teachers in a collection of school photographs from Chester-le-Street Grammar School dating from the school year 1960? If so, we would very much appreciate your help. Just click on “View Photos” above to see the collection. The Heritage Group has embarked on a major new project which is being funded by the Heritage National Lottery. As this is the centenary of the end of the 1914-18 war, the Group will be researching the names of those who were killed in the conflict and recorded on the various war memorials around the town. It is intended that the information discovered will give a greater insight into our Lads and Lasses and their families during those times. Interested in “LOCAL HISTORY” ? Need help with your RESEARCH? Then why not join “CHESTER-LE-STREET HERITAGE GROUP”. in the Salvation Army Citadel on Low Chare. meet the Members & view the Group’s Archive of our town. (Small charge of £1.00 for Members - £2.00 for Non-Members).